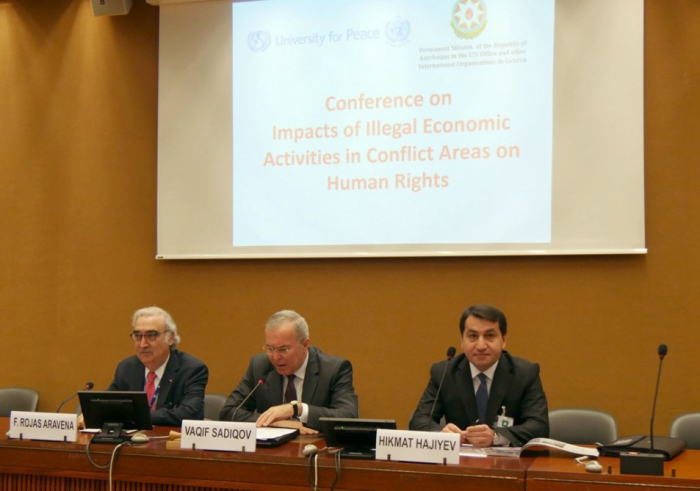 The United Nations Office of Azerbaijan at Geneva and the University of Peace, as well as other international institutions, organized an international conference titled "Impacts of Illegal Economic Activities in Conflict Areas on Human Rights", AzVision.az reports. Hikmet Hajiyev, head of the Department of Foreign Policy Affairs of the Azerbaijani Presidential Administration and Dr. Francisco Rojas Aravena, the rector of the University of Peace made opening speeches at the conference. Francisco Rojas Aravena touched on the academic role of the higher education institution on the promotion of humanism, international law and peace in his speech. He also stressed the significance of peace for sustainable development. Hikmat Hajiyev talked about the illegal activity of Armenia and other international organizations in the occupied Azerbaijani territories. The first session of the conference covered the discussions on the illegal activities in conflict-affected areas and international legal framework to reduce its impacts on human rights. The conference participants will exchange views on the obligations of the third parties regarding the illegal activities in conflict-affected areas in the second session. Also, the problems of several conflict-affected countries, such as Azerbaijan will be emphasized.